to simplify the computer documentation. We use a grid to document IV site location (we call it 'location specific' rather than 'vein specific' documentation) because many people disagree on the name of the vessel they've just accessed. I would dearly love to post a copy of our grid but have been unable to do so. I'm pretty illiterate and have no ides how to get the thing posted. If someone can help me out I'll give it another try. Is this grid part of computerized charting or is it paper charting? 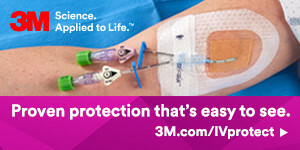 The INS standards of practice are written for all nurses in all setting performing IV therapy. They are written for the "lowest common demoninator" or as the basic standards for the least experienced nurse. The very first standard states that it is written for all nurses. I agree that vein names can be a challenge. Think about the cephalic vein - a superficial vein for the entire length of the arm. So simply stating this vein name would not provide any information about the actual location. INS standard #14 call for "anatomic descriptors, landmarks, or appropriately marked drawings". I am not aware of what your state board may say about this but would suspect that all state boards would defer to the INS standards. Also I don't think JCAHO would get this specific and would also defer to published nursing standards. Alma can you please email me, I would like to get a copy of your I.V. documentation grid. I will then post it to the site. Peter Marino R.N. BSN CRNI VA-BC Hospital based staff R.N. with no affiliation to any product or health care company. We're opting to use vein names, with other orientating descriptors. We're fortunate to be transitioning into an electronic health record (EHR), which will make it easier. We're starting with the IV Therapy dept, and fanning out to work with the other units that have staff with PIV insertion competency. I've been using this method (naming veins) on paper for a year now - it's simple, and doesn't take very long. There are only 7-8 veins to memorize (basic anatomy), so that's not so much an issue. Didn't we learn this in nursing school? Referring to Lynn's statement - yes, it is a challenge to document where on the cephalic or basilic vein, but we use centimeters as one descriptor. "Right cephalic vein 9 cm proximal to wrist." "Left median cubital vein, antecubital fossa." If wrist is not specific enough, we could get more specific and measure from the radial styoid process, for e.g. The orientative descriptors (left, right, medial, lateral, proximal, distal, etc.) are provided in the EHR software as buttons. There will be a hyperlink connected to an image showing the vein names. I'm convinced that we should be supporting evidence based practice. At the very least (but importantly), we have a few professional organizations that either outright state, or state by inference, that vein names should be used or that the clinician must at least know the vein names, and we have legal nurse experts highly recommending it. Those organizations are the INS, the ONS, and RNAO (Registered Nurse Association of Ontario). Lynn has provided references in another thread to an article describing radial nerve damage noted on cadavers that had had radial cephalic venipunctures - check it out. Sue Masoorli is another legal resource. Her chapter on IV Therapy in the Nursing Malpractice text in invaluable. And there are more. Infusion and vascular access clinicians are specialists, and are accountable to understand basic A&P and document as such. I would go even further and state that ANYONE - general practice nurses included - placing a device inside a patient's body must have basic comprehension of the anatomical structures involved. I'd love to see an MD's note documenting insertion of a chest tube using the descriptors: "right lateral chest"! Our Evidence Based Practice committee, and many managers, are totally supportive of this practice change. I will soon be getting an endorsement from the Quality and Risk Management Departments. Knowing vein names is just the beginning - if you know the name of the cephalic vein and are then familiar with the radial cephalic vein and the 2nd metacarpal vein - you'll probably know that that area is especially risky re: nerve damage and arterial puncture. One of the most frustrating themes I encounter as an educator is a clinician's disregard for the significance of vascular access devices - that they seem to be just those things taped on the skin nurses squirt things into. I believe requiring documentation using vein names is an important part of raising awareness of the significant patient safety concerns related to peripheral IVs. I believe that Joint Commission and the CDC WILL be paying attention to this issue in the future. Vascular access is in the spotlight - let's take advantage of this situation and rally together to advance practice instead of enabling the status quo, or "because we've always done it that way". Mari, I agree whole heartily with what you say. We too are changing to an electronic documentation media. Unfortunately my documentation ideal and the harsh reality of what is happening are much juxtaposed. When I encounter a problem, I document as you describe. Only I also add the words dorsal and ventral aspect. Writing a narrative note on the 20 some IV's I place daily is impossible. Now, if I were to be held to the INS 12 PIV's in an 8 Hr shift standard.... I could write a narrative on each and every Pt. Otherwise I document on a hospital approved flow sheet that has Rt., Lt., arm, wrist and hand, very vague. As for the floor R.N. 's and medical staff there is no documentation, nada, zippo! If they even do a PIV rather than call IV team! I also believe that the experts say they also find no documentation more than improper documentation, this is the reality. I also recall there being discussions of anatomical differences from person to person making naming the smaller veins we cannulate difficult. Again in a perfect world everyone should know basic A&P, but reality is much scarier. I hate to say it but most of the staff R.N. 's can't even assess a site!! The ER without fail plunks 20ga. PIV's in the A/C, out of range pH med's given in PIV's (including mid lines) and on and on and on....So IMO the integration of both a grid with veins already labeled may be the best solution. This is only one of many things (standards) that need attention when it comes to vascular access in my institution. We have to do something! I think compliance will be higher if the method is kept simple. I'm sorry but I think we have to spoon feed the masses. It definitely is a challenge - we have the exact same problems you do (ED and antecub, narratives for PIVs, NO documentation - makes case reviews and data collection really difficult, etc.). This is why I think we're fortunate to be going to an electronic record - we can document so much more quickly the necessary information that takes so much longer on paper. And - an EHR can have forcing functions so that the clinician can't move on until they've completed documenting correctly. I didn't push it in our facility so much until we began preparing for the EHR because of the challenge of this on paper. I'd also like to see the grid. Sue Masoorli has stated that 'pictures' or 'drawings' don't hold up well in court - another reason we went with actual vein naming, but I don't know if this grid would be in that classification. There are definitely anatomical variations from person to person. Most of the variations in the forearm and hand have to do with the tributaries to/accessories of veins, and we document them as such - cephalic tributary dorsal 7 cm from wrist. One common variation is in the antecubital fossa - according to Netter, 70% of people have a median cubital vein coursing through the antecubital fossa, and 30% of people have - instead of median cubital - median basilic and median cephalic, forming a "Y" in the antecubital fossa. As far as the basics - cephalic, basilic, accessory cephalic, median (or median antebrachial), metacarpal - I haven't met anyone yet who didn't have those veins. The variation I've noted is in the direction/orientation in which they course. Some people's cephalic veins course more medially along the ventral aspect of the forearm, and some more laterally (we have the option to use dorsal/ventral as descriptors also). Besides EHR, another thing that I think we're very fortunate about is that most of the leaders and many staff members in the other units that start IVs are motivated. There has been some resistance, but when they're presented with the material and the rationale, they've actually gotten excited about owning this as part of all of the best practices they do with patients - they WANT to follow standards of practice. I'm so relieved about this - if it wasn't so, the 'ideal' would probably be impossible to achieve. I'm grateful for your feedback; it's helpful to know the issues that other facilities are dealing with, what their solutions are, and good to know that there are so many clinicians out there who care! Has this grid been posted on the site? Here's the grid......at least I think so. I haven't had much luck adding attachments at this forum, but will try. I would also appreciate a copy of the grid for charting. What computer charting system does your institution use? Thanks so much for all the input. Thought I'd give you all an update. The computer folks here did put in a dropdown box with vein names, catheter lengths and gauges, and an area to chart unsuccessful sticks. There's also a "forced" charting when discontinuing a PIV...using the INS phlebitis scale and infiltration scale...so we got lucky, getting these in at the time they were asking for input on needed changes. Congratulations! We're moving ahead as well; some areas of panic and "AAAAAKKK!!!" "We can't do that! ", but for the most part it is going well. I was at a meeting recently - completely unrelated to IV Therapy - and the topic came up. One of the RNs from preop that I had inserviced proceeded to show the group her beautiful veins, and named all of the major veins in her forearm/hand. That was a good day for an educator.